Our permanent solution is called the ARTAS® System and it uses robotic technology to give you a healthy new head of hair. RHRLI’s board-certified surgeon, Baiju Gohil will use a robotic arm that seeks out the healthiest donor hairs available and transfers them to where they’re needed. The state-of-the-art technology also takes human error out of the equation, so your last transfer will be just as precise as the first. RHRLI is the only hair restoration center on Long Island that has ARTAS®. We want you to see the ARTAS® difference and give you information about recovery from hair transplants. FUE and FUT, What’s the Difference? 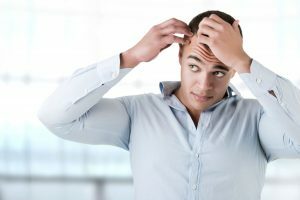 When you ask what your recovery from a hair transplant procedure is going to be like, the answer is that it depends on what type of procedure you have. There are two major types of hair transplant procedures. One is called follicular unit transplantation (FUT), often called “strip surgery.” The other is called follicular unit extraction (FUE). There are two types of FUE procedures. ARTAS® is a robotic FUE, while there are also FUE procedures that involve the use of hand-held devices. ARTAS® is a more accurate procedure than FUE procedures involving hand-held devices. According to the ARTAS® website, FUT is an older hair transplant surgery that’s more invasive than FUE. FUT involves a strip of scalp being removed from the back of the head. Stitches are required to close up the wound this creates. There are no stitches needed for the ARTAS® procedure. That makes the recovery a lot easier for ARTAS® patients. Whereas strip surgery patients often need prescription medication, which has potential dangers, ARTAS® patients sometimes don’t even feel pain and if they do Acetaminophen is usually prescribed. Because it’s invasive, FUT requires longer recovery times. There can also be post-operative side effects such as numbness and/or tingling, tightness of your scalp or lingering pain. Strip surgery also leaves a scar, which may require you to wear longer hair to cover it up, while FUE gives you the freedom to wear your hair the way you want to. And you’ll be back to normal life activities in just a few days, while FUT patients can take several weeks to recover. When you consult with RHRLI, we’ll explain every step of the ARTAS® procedure and you’ll see the ARTAS® difference. We can change your life with this hi-tech minimally invasive procedure. To learn more, contact RHRLI today.